How much debt can the US government afford? Nobody knows for sure, but it's pushing the envelope like never before - or at least more than it has since the Second World War, writes Mark Whitehouse. In its latest Global Fiscal Monitor report, the IMF offers an admonishment for the world's developed nations: Use this period of economic growth to pay down some of your debt. Pretty much all are aiming to make some progress, with one notable exception: the US. Thanks to the tax cuts and spending plans Congress has passed under President Donald Trump, the US government's debt is now projected to reach 96.2% of GDP by 2028. That's seven percentage points higher than the Congressional Budget Office's (CBO) 10-year projection from a year ago, and almost as high as in 1946, when the government had been borrowing heavily to build tanks and planes for the war. So how much is too much? As the world's largest economy and the issuer of its dominant reserve currency, the US gets more leeway than other nations. Its government bonds are considered the ultimate safe asset, at a time when such assets are in great demand. When crises hit, investors flock to the haven of the dollar, driving down US borrowing costs. As a result, the US government hasn't been punished for over-borrowing to the extent that others have. As long as interest rates remain low, the US can stabilise its debt burden with relative ease. The maths is simple: The ratio of debt to GDP will stay the same if the numerator (debt) grows at the same rate as the denominator (the economy). In the long term, the US economy is expected to grow at a nominal rate of about 4%. And the debt - if nobody actively adds to it - will grow at the rate of interest, currently forecast to be a bit less than 4%. So all the government needs to do is keep its primary budget (revenue and spending, excluding interest payments) roughly in balance, something it achieved as recently as 2007. But as Italy, Spain and many others can attest, borrowing costs can rise quite suddenly if investors start to worry about a government's ability or willingness to pay. Worse, such concerns are self-fulfilling, because higher debt-service costs make the burden much harder to bear. A loss of confidence in the US would be particularly fraught: the government could hardly step in to calm markets - as it did back in 2008 - if its own finances were the source of distress. So what could spook investors? One possibility is that they could start to doubt the government's capacity to get its debt back down to a level that has, historically, been considered prudent. The EU, for example, asks its members to target a maximum government debt of 60% of GDP. It's a benchmark that they have lately ignored, and there are other ways of looking at debt capacity, but advanced nations have also defaulted or taken other radical measures at lower levels of indebtedness. Could the US meet such a requirement? Say, over a period of 10 years? As recently as 2015, when the debt ratio was expected to hit 78.7%, this seemed feasible. Under the CBO's assumptions for GDP growth and interest rates, the US would have had to run a primary budget surplus of 2.4% of GDP to get the ratio back down to 60%. Based on the latest projections, with the debt ratio reaching 96.2%, the task is much harder: the required primary surplus would be 4.3%. As Greece can attest, such austerity can have dire political and humanitarian repercussions. Also, the US has never done it. Since 1800, the largest average primary surplus the US has sustained for 10 years was 2.9%, and that was during the post-Second World War boom. To be sure, governments can reduce debt burdens without resorting to austerity, though none of the options is particularly attractive. They can use regulation or other mechanisms to force banks to lend to them at low rates. If they borrow in their own currency, they can engineer a surprise bout of inflation, which boosts the denominator without affecting the numerator - but this can be hard to control and damage the country's credit. Ultimately, it's hard to know how much a government - and the US in particular - can borrow before things get out of hand. One thing for sure: it's a limit best left untested. Ratings agencies Moody's and Fitch recently reaffirmed their pristine ratings for U.S. debt. Total U.S. debt has risen past $21 trillion in 2018, but the agencies say the American economy can withstand pressures from the accumulating IOUs. Seven years ago, S&P stunned markets when it cut the U.S. credit rating by a notch. The agency has not raised the rating since. Treasury Secretary Steve Mnuchin with current national debt signage in background. The $21 trillion debt the U.S. has amassed on its balance sheet isn't weighing on the minds of credit rating agencies. Moody's and Fitch in recent days have reaffirmed the nation's top-notch credit standing, reasoning that even with the massive pile of IOUs, the nation has sufficient resources to keep its standing. "The affirmation of the US' Aaa rating reflects the US' exceptional economic strength, the very high strength of its institutions and its very low exposure to credit-related shocks given the unique and central roles of the US dollar and US Treasury bond market in the global financial system," Moody's analysts said in a report Wednesday afternoon. Those relatively glowing remarks come even as the debt tally continues to rise. Total public debt outstanding was at $21.06 trillion as of Tuesday, a 2.8 percent rise since the beginning of the year. Of that total, $15.34 trillion is owed by the public. There have been multiple warnings lately about the surging level - the Congressional Budget Office said the U.S. would be running a $1 trillion budget deficit within the next couple of years, and Federal Reserve Chairman Jerome Powell has said repeatedly that the nation is on an unsustainable fiscal path. However, the ratings agencies say the country has sufficient buffers to withstand debt pressures. "The U.S. sovereign rating is supported by structural strengths including the size of the economy, high per capita income, and a dynamic business environment," Charles Seville, senior director at Fitch Ratings, wrote in a report earlier this month. "While there has been a recent loosening in fiscal policy, Fitch considers debt tolerance to be higher than that of other sovereigns." Both Fitch and Moody's reaffirmed "AAA" and "Aaa" ratings, respectively, both of which reflect top-quality debt. However, Fitch did acknowledge that "the outlook for public finances has deteriorated since the last review." In particular, Seville cited the Tax Cuts and Jobs Act passed in December that slashed the corporate tax rate and reduced levies for millions of Americans. The agency warned that total debt to GDP could hit 129 percent in a decade. "Running a large deficit at this point in the economic cycle puts the public finances in a weaker position to confront any future economic downturn," Seville wrote. S&P, the third major ratings agency, has not updated its outlook this year but in June reaffirmed its "AA+" long-term and "A-1+" short-term assessments for the U.S. The long-term rating is one notch below top, while the short-term is considered prime. That long-term gauge is the same as it's been since 2011, when the agency delivered what was then a shocking blow by cutting its rating for U.S. debt. At the time, S&P cited political brinkmanship involved in the debt ceiling debates - a scenario that has played out multiple times since as warring factions in Congress have battled over spending. WATCH: Congressman rips impact of tax cuts on deficit. David Leonhardt, in his April 20 column "Credit to the real fiscal conservatives," advised which party has lowered or raised deficits. But he did not address the real fiscal problem. Deficits are an annual budget issue, whereas the critical fiscal problem this country faces is the accumulation of the deficits into the national debt. The debt is a forever issue and can crush our economy when the bill has to get paid. That can is repeatedly kicked down the road, but some day we'll pay for that fiscal irresponsibility. So the appropriate question to ask about fiscal conservatism is, "Which party has been responsible for the largest increases in the national debt?" "A coming debt crisis in the US?" warns a Deutsche Bank report* by Quinn Brody and Torsten Slok. This graph is gorgeous. 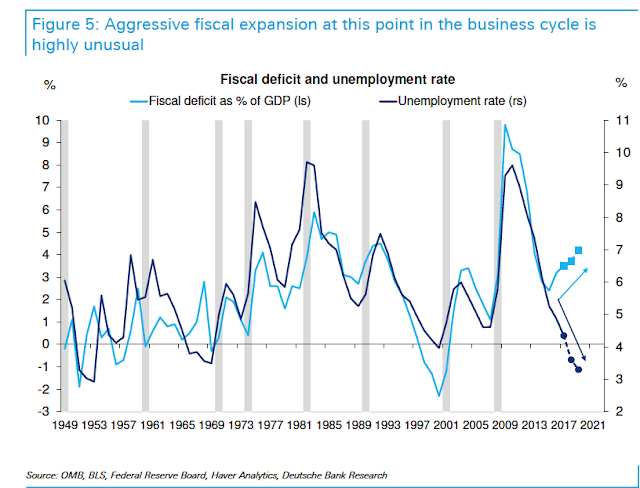 US deficits have, historically, been driven overwhelmingly by the state of the business cycle, and have very little to do with tax policies and spending decisions that dominate press coverage. In booms, income rises, so tax rate times income rises. In busts, the opposite, plus "automatic stabilizer" spending kicks in. There is a good reason past deficits did not really spook markets. They understood the deficit was a temporary phenomenon, due to temporary poor demand-side economic performance. We do not have that excuse now. the CBO argues that, assuming current policies and trends are not changed, "the likelihood of a fiscal crisis in the United States would increase. There would be a greater risk that investors would become unwilling to finance the government's borrowing unless they were compensated with very high interest rates." 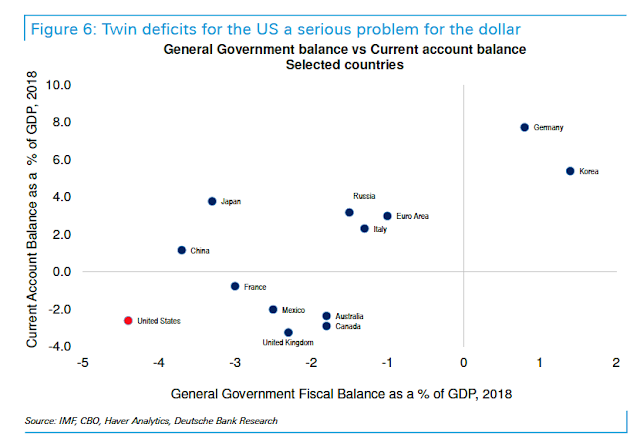 Historically, twin deficits have been considered a source of macroeconomic risk, including downward pressure on the exchange rate and upward pressure on interest rates. Over the last several decades, many emerging market countries have experienced severe crises and recessions when their external financing became stressed or reversed (Mexico 1994, Thailand 1997, Argentina 2002, etc.). Given these experiences, it is relevant to ask if the US could also have such an EM-style debt crisis. The Federal Reserve continues to embark on a ruthless strategy of divesting its trillion-dollar bond portfolio, not by growing the economy, but by eroding the value of the currency and by consequence, the value of government debt. 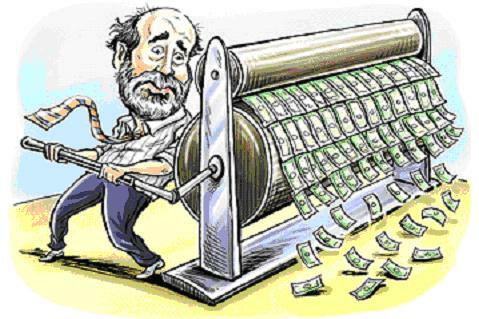 Anyone remotely familiar with the history of the U.S. Federal Reserve knows that the most effective tool residing in its arsenal is currency deprecation. Just ask any treasury official. The yield curve measures the spread between short and long term interest rates (the cost of money); it remains a key indicator of public sentiment about growth. Currently, rising bond yields reflect growing confidence in team Trump's economic policies despite contemporary divergence between short and long term rates. The yield on a 10-year U.S. treasury bond (or note) is approaching 3%; this isn't the Federal Reserve's policy to constrain growth, as it is a pivot to normalization. The benchmark remains a 10-year bond that encapsulates borrowing costs for businesses, consumers and local/State governments. Typically, sound economic growth tends to erode the value of bonds chiefly by an appeal to riskier assets. Although inflation may be a dominant factor behind yield gains given the rise of prices in commodities and oil; the U.S. geopolitical tensions with China continue to dominate the background of any real economic growth long-term. So what does the Fed seek to do with a trillion-dollar portfolio it cannot sell? It seeks inflation to erode away the value of government bonds by reducing the purchasing power of their fixed payments. In normal times this was called theft. Readers know the diverging institutional interests between main-street and Wall Street. We don't live in normal times. Today's Fed's interest rate policy continues to be unhinged or uninformed from economic fundamentals; it's all about unwinding Q.E. This is why tighter interest rate policies dominate Fed talk when working American's know our unemployment rate remains high. Here's the good news. Global interest rates remain historically low, this means we should expect the Fed's inflationary impact on depreciation to be countered by massive capital inflows, effectively strengthening the U.S. dollar. Can we expect those at treasury to abide by principles of sound money? It's too early to tell, but the U.S. remains poised to grow, making us far more attractive than foreigners. Continue to watch the yields on long-term bond yields, this is the final credible playing field to measure both contemporary economic sentiment and real growth. Given the geopolitical backdrop and cynical 24 hours news cycles, team Trump is winning. In a looming trade war between the world's two largest economies, American companies in China may have a bull's-eye on their backs. The Trump administration is pushing China to cut its trade surplus with the United States by $200 billion by the end of 2020 and give up policies that favor domestic companies - the core of Beijing's state-led economic model. As the two sides exchange threats of tariff hikes, their lopsided trade balance means China will run out of imports for retaliation before President Donald Trump does. But Beijing has other ways to inflict pain. Chief among those is harassing American companies that make autos, operate restaurant chains, sell computer software and do other business in China's heavily regulated economy. Other possible options include selling U.S. government debt or disrupting diplomatic efforts over North Korea, but those would damage Beijing's own interests. Trump has threatened higher tariffs on $150 billion of Chinese goods in response to complaints Beijing violates its free-trade commitments by stealing or pressuring foreign companies to hand over technology. Beijing reacted to his first round with a $50 billion list including American aircraft, soybeans and pork for possible retaliation. If it raises that to match Trump's total, that would be nearly equal to China's 2017 imports of U.S. goods. The Commerce Ministry has warned that no option is off the table. Chinese regulators have wide discretion and an arsenal of tools to disrupt U.S. businesses from withholding licenses to launching tax, anti-monopoly or other investigations. The U.S. chipmaker Qualcomm Inc. might serve as an early example. China is the final major government withholding approval of Qualcomm's proposal for its $44 billion acquisition of rival NXP Semiconductors. In April, the Commerce Ministry said Qualcomm's proposal "has difficulty" resolving concerns of Chinese anti-monopoly regulators. Qualcomm and NXP said April 19 that at the Chinese ministry's request, the companies withdrew and refiled an application for Beijing to clear the acquisition. China's entirely state-controlled media have encouraged consumer boycotts against Japanese, South Korean and other products during previous disputes with those governments. "China can harm the interests of the United States by limiting the operations of multinational corporations," said Jin Canrong, a foreign relations specialist at Beijing's Renmin University, in comments to the website wallstreetcn.com. Jin pointed to the example of South Korean retailer Lotte, whose business was destroyed by Beijing last year after it sold land to the Seoul government for an anti-missile system opposed by Chinese leaders. Beijing retaliated by closing most of Lotte's 99 supermarkets and other outlets in China. Seoul and Beijing later mended relations, but South Korean news reports said Lotte has given up on China and is trying to sell its stores. "Already we are hearing that approvals for some types of licenses for U.S. firms operating are being put on hold," the Eurasia Group said in a report. Chinese commentators say Beijing has financial weapons, though using them would cost China's own economy and international standing. Nationalists point to China's $1.2 trillion holdings of U.S. government debt as leverage. But Beijing would suffer losses if it sold enough of that to influence U.S. debt financing costs. And there are few other places to store such vast foreign currency reserves. Beijing also could obstruct U.S. investment in China, wrote commentator Ren Zeping on money.163.com. But that also would impose a cost by worsening an investment slump Chinese leaders are trying to reverse. Regulators could depress the state-controlled exchange rate for China's yuan against the dollar. That could help Chinese exporters and make U.S. imports more expensive. But it would carry a political cost by hurting other trading partners and making Beijing look reckless, possibly destabilizing financial markets. Beijing can appeal for support to U.S. allies that are miffed by Trump's "America first" approach and the U.S. withdrawal from the Paris climate pact and the proposed Trans-Pacific Partnership, a regional trade agreement. Trump's unilateral actions have allowed China, the most-closed major economy, to position itself as a defender of free trade. That could help Beijing win over governments that have criticized Trump for acting outside the World Trade Organization. China is a "central pillar" of the global trading system, "and we want to fully cooperate with China," U.N. Secretary-General Antonio Guterres said during a visit to Beijing last month. Beijing also has potential support from American companies and business groups that have criticized Trump and favor globalization. More broadly, Chinese commentators have suggested Beijing also could disrupt diplomatic work over North Korea's nuclear and missile programs or other initiatives. But analysts say that would risk setting back work Chinese leaders see as a priority. There's a bankrupt man running around the world with a paper dollar and a big gun. It used to be that older Americans managed just fine without taking on debt. No more. The proportion of older people with debt has been rising over the past decade or so, especially among those 75 and up, according to new research. The trend could place more financial strain on a group of individuals who typically live on fixed incomes, with little opportunity to boost their cash flow. "We've seen instances of seniors foregoing required medications . . . because they can't afford it," said Lori Lucas, president and CEO of the Employee Benefit Research Institute. "More seniors are carrying debt into retirement than ever before." The group released a new analysis of Federal Reserve figures showing that nearly 50 percent of retirees ages 75 and up now have some loans outstanding. That's up from 25 percent a generation ago, in 1992. The most significant debt increases have come among lower-income seniors. The median debt owed by people 75 and up is still fairly modest, at $20,900. That's well below average debts owed by Americans at younger ages. But people in the 75-plus group typically aren't working, so they don't have many opportunities to boost their incomes. Also, a $20,900 median debt doesn't look so great when you compare it with average Social Security retirement benefits of around $16,400 annually. Debts for older retirees primarily consist of mortgages, though some people might be turning increasingly to credit cards to make ends meet, said Craig Copeland, a senior research associate for the institute. Student loans account for a tiny fraction of debt for people older than 65, although it has become a growing problem for people in the 55-64 age range, he said. To the extent that seniors, or others, have credit-card balances or other loans with varying interest rates, the debt trend is worrisome. Many card companies have increased their rates over the past year or so, and rates have risen on home-equity lines of credit. What's driving the increase in senior debt? Many older Americans apparently are willing to borrow money out of a desire to help children or grandchildren financially, Lucas said. Some retirees also might have been encouraged to borrow money in recent years by the prolonged period of low interest rates and the broad availability of credit. In addition, it appears society has become more accepting of, and accustomed to, having debt. Your credit score can land you that dream job or prevent you from getting a mortage. Republic reporter Rebekah Sanders outlines how you can protect yourself from mistakes on your credit report. "The stigma attached to debt is less and less, so people don't feel as uncomfortable having debt, even though, at advanced ages, it may open them up to financial fragility," Lucas said. In other words, having more debt raises the vulnerability of borrowers to financial shocks, such as having trouble paying for an unexpected hospital stay or a surprise auto repair. Less obvious, seniors with debt problems could wind up falling victim to predatory financial companies touting debt-management fixes that might not pan out, especially as cognitive abilities decline with age, Lucas said. Rising debt burdens also might encourage some retirees to cut costs where they probably shouldn't, such as by foregoing medications or even meals, she said. If a person dies with loans outstanding and minimal other assets, it's possible that certain unsecured debts, such as credit-card balances or medical debts, might never be repaid. But that's not a good situation for seniors, especially as the financial strain could continue for years before death. Financial fragility usually is the result of not having adequate cash reserves on hand. The concept also was raised in a recent study by the Center for Retirement Research at Boston College. The upshot of that report had a different twist - that today's retirees generally are faring fairly well, from a financial perspective, but that younger generations will be more vulnerable when they reach retirement age. The reasons for that pessimistic outlook is that future retirees will derive less of their overall income from traditional pensions, which are becoming less common, and from Social Security. Even assuming Social Security is able to pay all promised benefits down the road, the gradual rise in the full-retirement age from 65 to 67 effectively means younger Americans will need to wait a bit longer to collect full benefits. Also, the report cited other challenges, such as potentially higher taxes on Social Security benefits for some people and rising Medicare premiums. Among solutions cited in the report: Downsizing to a smaller home to reduce costs, working longer to boost income, buying annuities to secure steady income and considering a reverse mortgage (if you own a home) to lock in steady income. In short, future retirees likely will need to rely more on personal savings, such as assets held in Individual Retirement Accounts, workplace 401(k) plans and housing equity, to make up for the decline in guaranteed sources of income. It remains to be seen whether most people are up to that challenge. Are We Trapped In A Debt Spiral? From Scotland, where Adam Smith pioneered systematic thinking about economics, comes an adjective, "carnaptious," that fits people who are allergic to economic euphoria. It means cantankerous. Let's think carnaptiously about this fact: The interest rate on 10-year Treasury bonds recently rose briefly to 3, and soon may move above this. This is more than evidence of the economy's strength. It also is a harbinger of a coming day when the great driver of the national debt will be ... the national debt. Pour a Scotch and read on. This is a result achieved when both ends of Pennsylvania Avenue are controlled by what still fancies itself a conservative party. What are the chances of fiscal improvements arriving after the electorate returns many congressional Republicans to the private sector of which they speak so fondly? The Manhattan Institute's Nicole Gelinas notes that "from the 1960s through the beginning of the financial crisis, Treasury rates never fell below 3%, and they were often several percentage points above that." In 2007, the Great Recession arrived in December when the national debt was $7.5 trillion and the average interest on it was 4.5%. Imagine paying 4.5% on today's $16.5 trillion debt. The Congressional Budget Office projects that new federal borrowing over the next 10 years will total $12.4 trillion and that at the end of 2028, the debt will be $28.7 trillion - 96% of GDP, up from 39% in 2008. But the CBO is required to pretend that Congress will not make matters worse. Its projections must assume the continuation of current law. So, the CBO must assume that the caps on defense and nondefense appropriations imposed in the Budget Control Act of 2011 will be enforced in 2020 and 2021. But those for 2018 and 2019 have just been discarded. How likely is a reversion to disagreeable discipline? The CBO must also assume that Congress meant what it said (in order to cram a spending bill under parliamentary rules) about cuts contained in the new tax law expiring after 2025. Some legislators want to make those cuts permanent immediately. The American Enterprise Institute's James Capretta says of last year's CBO projection that the federal debt would reach 150% of GDP by 2047: Discard the mandatory fictions and that level is reached much sooner. Gelinas says that by the end of 2017, Americans' household borrowing stood at $15.3 trillion, "just shy, in inflation-adjusted dollars, of what it was in 2005, the year before the housing bubble peaked." And although "Americans are now spending less of their income on debt - about 10.3%, down from roughly 13% between 2005 and 2008 - they didn't use the period of super-low rates to reduce their debt, which means they're vulnerable to higher rates." When such rates arrive, and debt service swells the debt, what can government do? When the Korean War erupted in June 1950, Congress slashed discretionary nondefense spending by 25%. Back then, however, such spending was 29% of the budget. Today, sacrosanct transfer payments are 70% of the budget, paying debt service (7%) is mandatory, and discretionary nondefense spending is 15%. So, government cannot act as nimbly as it did 68 years ago. Hillsdale College's Gary Wolfram notes that total discretionary spending - including defense - for fiscal 2019 is projected to be $1.362 trillion, which is just $381 billion more than the projected deficit. All this means trouble, unless Mr. Art of the Deal can negotiate with arithmetic, persuading it to amend its rules so that trillion-dollar deficits will not mean trillion-dollar increases in the debt. Is the USA trapped in a debt spiral? Anyone who can't see it, is in denial. What is the national debt? If you have a mortgage, student loans or a balance on your credit cards, you owe a debt. And if you do have debt, you're in some good company - the U.S. federal government has tons of it. As of June 4, 2018, the total outstanding debt owed by the federal government was $21,090,788,185,039.90, or $21.1 trillion. Yes that's an astronomical number, but it's not necessarily a bad thing; in fact, United States government debt is considered the safest in the world, according to Lawrence White, an economist at the NYU Stern School of Business. "It is mostly an abstract concept, unlike, say, a personal student loan or auto loan or mortgage, where you have a personal obligation to repay the debt," said White. "If you don't repay, there are legal consequences that are going to be unpleasant. For an individual, the national debt has none of those particular characteristics. It is an obligation of the US, not an obligation of an individual." That doesn't mean the national debt doesn't affect you. If the US were to default on its debt, the interest rate on its debts would increase, which would be disastrous. "That would mean our taxes would increase or other government spending would have to decrease," said White. "It would throw financial markets into chaos." The federal government borrows money in the form of Treasuries (notes, bills and bonds; more on that later). Treasuries are a government's debt obligation, and because they are backed by the credit and taxing power of a national government, they're considered low-risk. Perhaps the biggest recent example of the use of borrowed money was the TARP program used to bail out the bank and auto industries in the wake of the 2008 financial crisis. Who owns the national debt? One of the biggest holders of national debt is the government itself. Federal agencies, like the Social Security Administration, the Office of Personnel Management Retirement, and Medicare own $5.7 trillion worth of the debt as of March 2018. This is called intragovernmental holdings. When an agency, like the Social Security Trust Fund, brings in more in tax revenue than it needs to spend, it buys US Treasuries. Treasuries are the notes that hold value: there are Treasury notes, bills and bonds. The name refers to the time period a lender will hold on to it. Treasury notes are short-term, usually a few months; Treasury bills are medium-term, a few years; and Treasury bonds are long-term, more than a decade. The remaining $15.4 trillion is held by the public - individuals and companies. This includes foreign governments. China is the largest foreign holder of American debt, holding around $1.19 trillion as of March 2018. Japan held $1.04 trillion as of March. It's worth noting the US government also lends money to foreign governments. Has the national debt ever been paid off? In 1999 and 2000, the federal government briefly ran budget surpluses. (A budget surplus occurs when the government is bringing in more money than it spends - something every household should be doing, ideally.) During that period, we were paying down some of the debt we owed rather than adding more. Under George W. Bush's administration, we returned to running a budget deficit and have been since. The national debt has been paid off only once in American history. In 1835, President Andrew Jackson paid it off in full. It only lasted a year. Is it a good idea for the federal government to be in debt? Just like personal debt, sometimes it makes sense for federal governments to borrow funds. "During recessionary periods, [the government] is seeing a shortfall of revenues, and unemployment is high," said White. "There needs to be larger aggregate spending, and that spending happens through borrowing." "On the other hand, when the economy is booming, we shouldn't be seeing a lot of government borrowing. That's not a good time because that can just add to inflationary pressures." White said that's one of the biggest dangers the tax cuts of December of 2017 pose to the nation. "The national deficits are going to get larger because of the tax cut," said White. "Tax cuts are occurring when the economy is at basically full employment. That's not a time when we should be running deficits; we should be running national surpluses." 'Headline' inflation rose 0.2% in May, but is up 2.8% over the last 12 months, highest since February 2012. Core inflation also increased 0.2%, showing that gasoline prices are not the sole source of inflationary pressure. Non-seasonally adjusted inflation was up 0.42% in May. What does this means for holders of TIPS and I Bonds? The Consumer Price Index for All Urban Consumers (CPI-U) increased 0.2% in May on a seasonally adjusted basis, the U.S. Bureau of Labor Statistics reported today. Over the last 12 months, "headline" inflation rose 2.8%. The increase of 0.2% matched the consensus estimate, so this report is not going to jolt the financial markets. But the 2.8% annual increase is the highest recorded since February 2012, more than six years. Gasoline and shelter were key factors in the May inflation report, with gasoline prices up 1.7% for the month and 21.8% over the last 12 months. Shelter costs rose 0.3% in the month and are up 3.5% over the year. Food prices, however, were flat for the month and are up only 1.2% over the last 12 months. The cost of used cars and trucks fell sharply, down 0.9% for the month. Holders of Treasury Inflation-Protected Securities and U.S. Series I Savings Bonds are also interested in non-seasonally adjusted inflation, which is used to adjust principal balances on TIPS and set future interest rates for I Bonds. For May, the BLS set the inflation index at 251.588, an increase of 0.42% over the April number. Amid soaring stocks and positive employment trends, it's difficult to believe that under the hood, America has a real problem: its debt. The United States' total debt was $19.9 trillion at the outset of the newest administration, but an expansive tax bill bumped this figure to over $21 trillion, which is set to balloon in the coming years. This trend has set off alarms in some circles. Last September, when the national debt hit the psychological $20 trillion mark, Senator Bob Corker tweeted that the "Greatest threat to our nation is our inability to get our fiscal house in order." This sentiment was echoed more recently by Howard Schultz, former executive chairman of Starbucks, on the CNBC show "Squawk Box". Schultz also warned of the stock market's false signaling and spoke on the danger of rising debt and interest rates that future generations must face. Though Starbucks gave universal raises to its employees after the recent tax cut, Schultz acknowledged that it wasn't enough. Debt may be a collective economic problem, but it's experienced on a per capita basis. A number cannot represent the suffering of any single individual overburdened with debt. Being saddled with constant, draining debt is an obvious obstacle to one's future success-or at least, most would agree that it is. This empathy doesn't extend to the court system, which puts an impossible burden of proof on what it is to suffer an 'undue hardship' that justifies the abolishment of student loan debt-one of the biggest weights on the 'liabilities' side of the public balance sheet. This wasn't true until 1990. Before Congress changed the law, it was possible to discharge a student debt after demonstrating five years of responsible repayment, but not anymore. Congress has yet to define the term 'undue hardship', so fighting a battle in court is always a losing one-especially considering how much legal fees might add to a student's mounting debt. For all intents and purposes, those nursing at the government teat have an unlimited supply of milk at their disposal, but being wasteful with it is detrimental to everyone. Using taxpayer dollars and deep public pockets to fight delinquent borrowers in court is a logical necessity, but it's possible to be fiscally responsible at the same time. Part of this effort is to scrutinize potential borrowers more carefully, but also to be more cautious when chasing them. The government's debt collectors should borrow their strategies from private lending companies, who are undoubtedly more conservative. Private lenders tend to consider discharge or bankruptcy lawsuits on a case-by-case basis, to determine if the cost of litigation is worth the sum that they're likely to recover from cash-strapped borrowers. It often isn't, and so lenders will sell their debt or pursue another avenue of remuneration. This will ease the burden on suffering citizens while concurrently wasting less time and money. Student loans are repaid into the enormous coffers of the Education Department, but if you can't make payments, they'll send their personal hound dog after you. The Educational Credit Management Corp. is a private group of litigators working at the pleasure of the government, and it goes after those who have filed bankruptcy and cited student debt as a reason why. Using scorched-earth tactics, the group makes it financially unfeasible to use student debt as an impetus for bankruptcy. However, this travesty doesn't even address why the Education Department must go on the offense at all. It may be logical to have lawyers protect the Department's best interests, but few believe that their energy is best spent hunting the country's next generation. The introduction of social programs in America came at a time when life expectancy was lower. Now that modern medicine has increased the chances that citizens will live further into old age, the cost of these programs has expanded significantly. Instead of being able to redeem social security at the sprightly age of 62, moving it up to 68 or 70 would make more sense. Like fighting bankruptcies, the government should also consider social benefits eligibility on a case-by-case basis. Some tradesmen, for example, would be eligible earlier due to the difficulty of continuing a strenuous career, while lawyers and other desk jobs would need to wait longer before attaining eligible status. One of the most common facts trotted out in the debt reduction conversation is that America spends more on its military than the next 10 countries combined, most of whom are allies. Much of this is due to the military's role as an employer, but also because of America's self-imposed role as a sort of world police force. Waving a flag of democracy, the US looks after the civil rights of global citizens-especially when financial opportunities also align with its democratic values. Reigning in military spending and focusing on improving from within, and not from without, would lift an enormous pressure from the national budget. However, like student debt and the cost of higher education, this is a hot-button topic that few politicians like to address, especially when facing an election. Many countries have debts, but few handle it quite like the United States. While many of the potential strategies outlined above may work, American politicians will need to refrain from partisan politicking or risk a situation that spirals out of control. Politics aside, there are real solutions to the very real problem of debt, and just because it's mounting does not mean it's insurmountable.